Scott Kersey, Professor of Mathematics at Georgia Southern University shared his experiences of using open source content for a STEM majors calculus course. 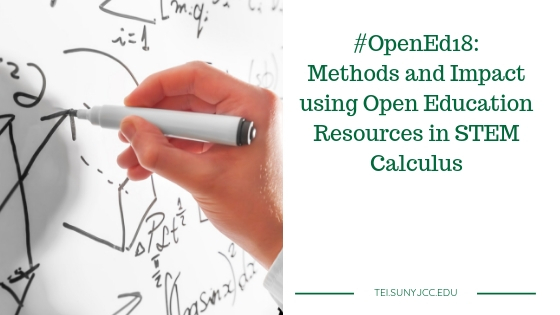 His research compared OER students (OpenStax Calculus and WeBWork) versus non-OER students (Thomas’ Calculus and MyMathLab). To begin his presentation, Kersey highlighted the materials he was using to support his course. To develop homework problems, Kersey worked with the engineering department to develop problem sets. These problem sets were added to WeBWork, a homework problem generator. You can access the problem sets he created off of his personal website. In an OER class, students have access to course content immediately. In his study, he tracked the percent of logins to the homework system. First login to the homework system is significant. The earlier that students start engaging with the course material, the more success they have. Pretest success is also significant. Having students do preparatory work prior to the pretest will also result in higher levels of success. Students would like to take more courses with free or low-cost materials. Students do not like to learn from text. They learn best with hands-on activities. The OER effect of early access diminishes over time. One of the benefits of OER is that you can distribute the content before the class even begins. WeBWork has limitations compared to MyMathLab. The big question is how to prepare students before the class begins. There were a number of great takeaways from this presentation. Primarily, the importance of having students refresh before jumping into class and getting them involved with the material as soon as possible.